Wising All My Readers a Very Blessed Thanksgiving Day. This Thanksgiving morn kindles fond memories of my Aunt Barb. She was the eldest of my father’s seven siblings, always a special one to me on this day. My aunt made Thanksgiving look and feel like a Hallmark commercial or a “pop-up” cut-out card to be treasured in a box under the ruffle of my bed. If she were alive today, she would long be in the midst of Thanksgiving preparations, cozy and warm within the confines of her Bay City, bungalow. Like a snow-globe found in a department store, a child’s hold could shake it to see her smiling there while stuffing turkeys, preparing pies, or filling crystal candy dishes for her nieces and nephew’s with colored, M&M’s. My aunt Barb took it upon herself to create an extended tradition for my enormous family, one that I have never forgotten. Generous in spirit, humble and kind, she was a special person through and through. Blessed to have escaped a rare gene that ravaged the lives of three of her younger sisters, she made silent promises to God, I believe, in going above and beyond in ways others could not. My aunt’s house was not a large home, two bedrooms and a bath. Her galley kitchen was small with black and white linoleum covering the floor. I remember the stairway going to the basement was directly in the back, with a windowed door in between. On Thanksgiving, it was forever left open. Once you passed through, magic began to happen. I can still hear the clicking sounds of my patent leather Mary Jane shoes as I raced my cousins down the stairway to the heart and home of Thanksgiving. The basement was divided into two large rooms. It wasn’t finished in a fancy custom design like basements are today. No, simple cement block walls greeted me, painted in bright and cheery pastel colors. I remember being in awe of an extra kitchen at the bottom of the basement stairway, making me believe my aunt was rich! Looking back, it was nothing more than a row of necessities to make life easier on Thanksgiving Day. An old farm sink in shiny white, a gold oven with a big round clock on top and a white refrigerator that made buzzing sounds. Still, extra turkeys browned and baked within the oven’s warmth, jiggly salads of jello chilled in the refrigerator’s coolness, while dishes were endlessly washed within the basin of the sink. The basement’s tile floor beneath our shoes was shiny and bright. There was a corner where all of us kids took turns bending down to see our faces in it. Windows were all around the bottom of the cement wall, allowing fall sunlight to peer in. Our cousins smashed pink noses flat against the glass of dust to see us from the outside. In return, we teased them from the inside. They were missing all the FUN! The smells of pumpkin pie, the games we played and oh, the mischief in the basement there! In the next room was a table the length I’d never seen before. Actually it was a combination of several little tables, all pushed together so one and all could sit together. Anticipation seemed to last f.o.r.e.v.e.r! Finally, my mother, together with all of my aunts took turns bringing in plate after plate of delicious food that smelled so-good! Carefully, they sat each colored platter and bowl on top of colored cloths while lifting lids up above, allowing sizzling steam to escape. I marveled at the twirling smoke, watching it swirl to the very tip of the ceiling. 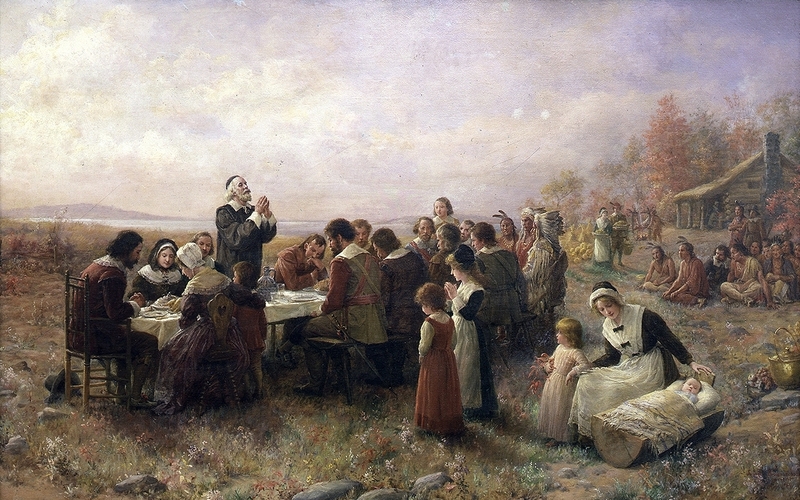 Soon my father said the Thanksgiving Day prayer, giving thanks for our many blessings. Always, he added a special tribute to Aunt Barb who brought our great big family together, making us all one for the special day. After bellies were full, women pitched in to help clean-up, children scattered outside to play make-believe, while men trudged upstairs to the living room to watch afternoon sports on a colored television. Babies cried, mother’s bounced them on their knees, and daddies passed them back and forth. Toddlers teetered, older cousin’s sneaked M&M’s from crystal bowls, little boys played cowboys, and I dreamed imaginary tales while talking with my cousin in the “woods” beside my aunt’s shingled house. There wasn’t any woods, really. An extra lot with a few trees, but to me it was Sherwood’s Forest…. When I picture my Aunt Barb today, I see her like she always was. A beautiful face with skin the color of perfect porcelain. With eyes as bright as the ocean blue, they truly were the “windows to her soul.” She had a tremendous love for family together with an amazing zest for life. She did almost anything she ever wanted. My aunt traveled the world while helping others. She laughed every day, smiled while twinkling her eyes and danced in life. I remember as a little girl, she used to tell me I was her special gift because we shared the same birthday. Truth be told, she was my special gift. Year after year, my Aunt Barb brought our overflowing family together on Thanksgiving Day. I’ve cherished those memories ever since. I will forevermore. Posted on November 27, 2014 by kcg1974 •	This entry was posted in Health. Bookmark the permalink. What beautiful Warm and Happy Memories Kim of your Aunt Barb… No wonder you have cherished them over the years..
Sue, thank you for your heartfelt comment that indeed discovered the cherished memories of my dear aunt. No amount of time that passes will ever erase such love from my mind. The gift of ‘memories.’ Happy Thanksgiving to you, too, Sue! Thank you for being here with me to read them, Indah. My pleasure to share them. Such a gift of ‘tradition’ I was given that is often lost upon us in our busy world. Blessings. Sounds like every Thanksgiving day should be – thank goodness too for the richness of Kim Gosselin’s memories of those times. Thank you, Sally. A very different Thanksgiving than planned. One son’s family sick with the flu while the other’s wife in bed with babies. Overall, counting our many, many blessings today. Thinking of you, always with love and gratitude. It sounds an idyllic time. Your aunt sounds like the person we’d all like to know or all like to be. I suspect you’re very like her.Certainly as wonderful. David, thank you as always. She certainly was a very special lady, heartwarming and kind. One of whome I would be so very lucky to emulate. Love to you. Enjoyed your memories. So vivid and yummy. Happy Thanksgiving, Kim. Oh, Raj, you should write memories of your ancestral home one day! All that you shared with family during holidays in Mumbai would be fascinating to many of us here at WordPress! Would so love to read of your festivities there. Thank you so much for reading together with your kindness, Dear Raj. Blessings. Sara, my sincere thanks for Reblogging my wonderful memories of years gone by. How I wish everyone could have had even ‘one’ Thanksgiving, like I did!! Blessings. Hello beautiful, Merry Christmas. I’m writing a story. Thank you so very much, Sara. Always love to see you here! What is your story about? I’m excited for you. Keep writing and tell me more. Merry Christmas to you, Sara. Blessings.